Affiliations: Classmate of Brian Braddock, Courtney Ross, Sandy York, Charley, Tommy. Enemies: the alien beneath Loch Ness, Brian Braddock, Captain Britain (Brian Braddock), Commander Lance Hunter of STRIKE, Lord Hawk, the Highwayman, Mr.McNab, the robotic Loch Ness Monster. 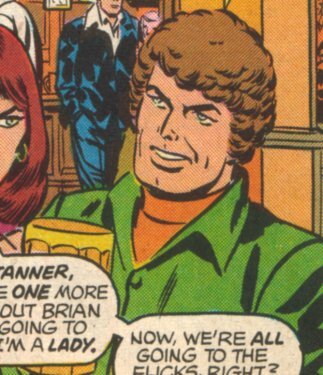 History: (Captain Britain Weekly#3) - Jacko Tanner was having a pint in the Flying Finish Pub at Thames University with classmates Courtney Ross and Sandy York. His chosen topic of conversation was how much of a spineless wimp Brian Braddock is, which only served to annoy Courtney, who told him to cut it out. Spotting Brian just arriving in the pub, she invited him to join the group who were about to go to the cinema, but he declined. As they left, Jacko couldn't resist one final jibe at Brian's expense. (Captain Britain Weekly#4) - Jacko Tanner and two of his friends (one of them named Charley, the other probably Tommy from#8 based on his hair colour) nearly caught Captain Britain exercising his new acrobatic skills in the Thames University gymnasium in the early hours of the morning, but the hero heard them just in time to switch to his civilian identity of Brian Braddock. Witnessing Brian making a rough landing (as he had to transform whilst in mid-air) Jacko ridiculed his lack of athletic prowess. Angry words were exchanged, before Brian turned and walked away rather than let things lead to a fight. As he left the room, Jacko called him gutless. Only a few minutes later the hero was forced into battle with the supervillain Hurricane, with Jacko and his friends as witnesses to the event, and the hero's subsequent defeat. (Captain Britain Weekly#5) - Shortly after Captain Britain awoke, Hurricane was long gone and one of the buildings damaged in the battle collapsed. Jacko was among the people who aided the fire service in trying to free those trapped in the rubble, and he expressed his admiration of Courtney Ross to the hero for her part in the rescue operation. When the hero finally had a chance to sneak away and transform back into Brian Braddock, Jacko's annoyance at his excuses for why he didn't show up earlier to help with the rescue was evident. (Captain Britain Weekly#8) - As a winter snow shower started and Brian and Courtney arranged a date, Jacko angrily told his friend Tommy that he would make Brian regret stealing her away from him. But Brian was forced to leave suddenly when his sister Betsy turned up to tell him their brother Jamie had been in an accident. As he departed, Jacko told Tommy that this would be his chance to make his move. (Captain Britain Weekly#19) - Three days had passed since Brian left for Braddock Manor. Now Captain Britain, along with his new ally Captain America, were both believed to have been killed in the bombing of that place, and their coffins lie in state at St. Paul's Cathedral. Jacko Tanner and Courtney Ross watched news reports about the death of the patriotic British hero at Thames University, and initially Courtney looked to Jacko for emotional solace. But his callous attitude towards the situation got him a slap in the face, and he angrily told her to get her "milksop chum" Brian to hold her hand, before striding away in a rage. (Captain Britain Weekly#31) - Once again Jacko was witness to one of Captain Britain's battles, this time with Lord Hawk. Feeling that the hero was an "overrated creep" and angry at Courtney's feelings for him, he decided to knock "her flamin' idol off his pedestal". While the hero was concentrating on the supervillain, Jacko jumped him from behind, distracting him long enough for the villain's mechanical hawk to grasp Britain in its talons and lift him aloft. (Captain Britain Weekly#32) - Realising that Lord Hawk was directing the bird with his control box, Jacko seized the device off the elderly villain, intending to use it and the hawk to capture Captain Britain. Meanwhile the airborne hero had managed to better his position, so that rather than being held by the hawk, he was now hanging on to it. With Jacko now operating the control device, the hawk nearly smashed the hero off of some buildings, before going into a nose dive high above a football stadium. Britain managed to get in to the bird's control wires, leveling it out just in time, but was still stunned by the impact with the ground. He regained consciousness just as Jacko Tanner and Detective Inspector Dai Thomas reached the scene and attempted to unmask him. (Captain Britain Weekly#33 (fb)) - Both Jacko and Dai Thomas were thwarted in their plans by the arrival of Commander Hunter of STRIKE, who took Captain Britain away for urgent medical treatment. When Jacko told Hunter that he was responsible for bringing the hero down, and that he wanted the world to know it, the agent christened him "Jerko" and warned him that if Britain did not recover then Hunter would make Jacko pay for injuring someone on "our side of the law". (Captain Britain Weekly#37) - Jacko encountered Brian Braddock, now recovered from his injuries sustained during the Lord Hawk incident. Tanner was off to visit Courtney Ross in a hospital, where she was taken after being struck by a bus. He berated Brian for not visiting her, claiming his rival didn't really care for her. Chastised, Brian asked Jacko if he could accompany him to the hospital, and reluctantly Jacko agreed. Thus it was that a short while later the two were in a car together when they came across the wreckage of a truck ripped apart by the Highwayman's deadly motorcycle. Spotting the villain, Jacko gave chase and tried to get him to pull over, but the Highwayman ran them off the road. (Captain Britain Weekly#38) - Recovering consciousness, Brian pulled Jacko from the wreckage. 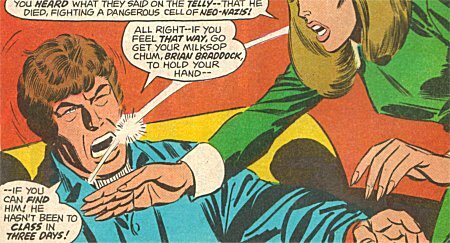 Noting that he was still alive, Brian prayed he had no internal injuries and then transformed into Captain Britain to pursue the villain. As the battle raged between hero and villain a few miles away, Jacko recovered consciousness and noted that Brian, "the yellow punk," left without even lending him a hand. (Super Spider-Man and Captain Britain Weekly#233) - Jacko, Brian and Courtney were amongst a group of students from Thames University who traveled up to Scotland as part of a scientific investigation into the Loch Ness Monster. Jacko continued to harp on about Brian being a coward, stating that other students wouldn't venture within a mile of the Loch if they thought there was any real chance of finding the monster. When Brian failed to show for the group's planned bathysphere descent the next morning, Jacko took this as proof of earlier statements, unaware that he was in fact drugged the night before in order to prevent Captain Britain from becoming a threat to the mysterious villains who were controlling the monster. The bathysphere had been sabotaged, and began to take in water. The cable holding it snapped, and it sank to the bottom of the loch. Thankfully Brian managed to resist the drugs he had been given, and Captain Britain came to the rescue, safely bringing them back to the surface. (Super Spider-Man and Captain Britain Weekly#234) - While Captain Britain vanished under the water to investigate, Jacko did some detection work too, finding that the cable that gave way had in fact been cut. Courtney found a button torn off someone's coat, and Jacko spotted that it belonged to the innkeeper of the inn they had been staying at. He confronted the man, accusing him of trying to kill them, and the innkeeper dived into the Loch. When Brian rejoined them (having defeated the villains beneath the waters of the Loch), the students, now without working equipment, abandoned their investigation, Jacko as sceptical as ever about the chances of there actually being a monster. Comments: Created by Chris Claremont, Herb Trimpe and Fred Kida. No explanation is ever given for Jacko's dislike of Brian Braddock, although there are hints. It can't be because Brian is academically inclined -- Jacko is at University as well, which means he is too, to some extent (we don't have sports scholarships in Britain, and besides Jacko goes on the same field trips Brian does, suggesting they do similar courses). It could be in part because of Brian's privileged background, and a lot of it looks like it might be tied into Courtney's interest in Brian. Jacko blaming Brian for stealing her from him (CB#8) is a bit rich, as prior to this point she seems to be the one chasing Brian. In CB Weekly#38 after Brian Braddock has pulled Jacko (quite haphazardly judging by the artwork) from the wreckage of their smashed car, he worries that Jacko may have sustained internal injuries (yeah, especially as moving him so carelessly would have made them much worse!). And then he transforms into Captain Britain and sets off after the Highwayman, leaving the injured Jacko by the car! If he does have internal injuries he'll bleed to death! Mind you, Jacko did nearly kill him in#33, so maybe he is just returning the favour. When Jacko wakes up he notes that Brian left him without giving him a hand -- I'm sure this was intended by the writer to show Jacko as an ungrateful prat, but frankly, Jacko is right. Brian did everything he could to improve Jacko's chances of sustaining serious injuries. In fact when Jacko awakens, it's clear from the art that Brian didn't leave him by the roadside -- he left him ON the road, and a motorway (freeway to the Americans out there) at that. 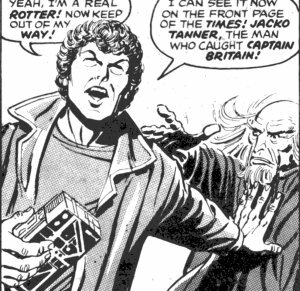 I've listed both Captain Britain and his alter ego separately as enemies of Jacko Tanner , since he hated both and tried to cause trouble for both individually, without ever knowing the connection between them. anyone else called Jack, Jacko or any variation thereof. Charley Charley was one of Jacko friends, seen to use the gym with him in the mornings. He followed Jacko's lead when it came to taunting Brian Braddock. In CB I#31 Jacko is seen to be chatting to a friend about Brian again, and it seems likely that friend is either Charley or Tommy. Tommy Tommy was one of Jacko's friends at Thames University. He's seen to use the gym with Charley and Jacko. Unlike Charley he doesn't seem to be as bothered about taunting Brian Braddock, but he does note Courtney Ross' interest in Brian, which only serves to annoy Jacko further. In CB I#31 Jacko is seen to be chatting to a friend about Brian again, and it seems likely that friend is either Charley or Tommy.